Map is active and can be used to select area for more information. Death Valley National Park is located on the eastern border of south-central California and includes a small area of Nevada. 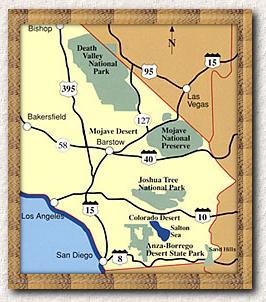 Running more than 50 miles southwest-to-northeast and more than 150 miles northwest-to-southeast, it is the largest national park in the contiguous U.S. Ecologically, its plants and animals of are representative of the Mojave Desert; geologists consider it to be located in the southeastern Great Basin Desert. Death Valley itself is a large desert trough nearly surrounded by mountains. 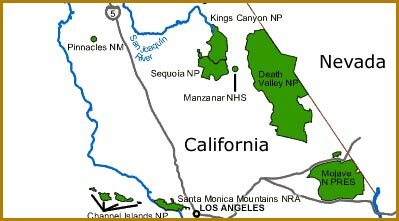 It is nestled between the Amargosa Range on the east -- which includes the Black, the Funeral and the Grapevine Mountains -- and the Panamint Range on the west -- which includes the Cottonwood Mountains. The Owlshead Mountains rise at the south end of the park and the Sylvania Mountains border the northern end. It contains the lowest point in the western hemisphere -- 282 feet below sea level near Badwater -- as well as numerous high-rising mountain peaks, including Telescope Peak at over 11,000 feet. Death Valley was named by gold-seekers, some of whom died crossing the valley during the 1849 California gold rush. Death Valley is generally sunny, dry and clear throughout the year. The winters are mild with occasional winter storms, but summers are extremely hot and dry. In fact, Death Valley is one of the hottest places on earth, attaining the highest temperature ever recorded in the U.S., 134 degrees F. on July 10, 1913. Summer high temperatures commonly run above 120 degrees F. Comfortable clothing providing sun protection and a broad brimmed hat are recommended in summer. Winter requires warmer clothing and light to medium jackets. Sturdy walking shoes are important year round. Most rainfall is blocked by the Sierra Nevada Mountains to the west, accounting for Death Valley's extreme aridity. In fact, Death Valley averages less than 2 inches of rainfall a year. For a recent 50-year period, the average annual rainfall at Furnace Creek was only 1.66 inches. But high temperatures and low humidity account for an extremely high evaporation rate. In fact, in Death Valley, the evaporation rate is 128 inches annually, 77 times the precipitation rate. U.S. Route 395 passes west of Death Valley and connects with California Routes 178 at Inyokern and 190 at Olancha, both of which enter the park from the west. I-15 passes to the southeast of Death Valley, connecting with Route 127 at Baker, California. 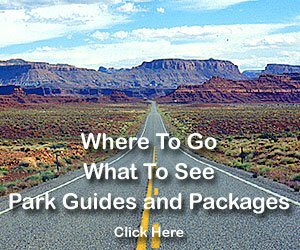 Drive 60 miles north then turn left on Route 178 just past Shoshone, or drive 20 miles further north to Death Valley Junction and turn left on California Route 190 to enter the park. U.S. Route 95 passes north-south through Nevada east of the park connecting with Nevada Routes 267 at Scotty's Junction, 373 at Amargosa Valley and 374 at Beatty, all of which lead to the park from the east. From Las Vegas, Nevada, Route 160 leads to Pahrump where a left on Nevada Route 132 (which becomes California Route 190 at the state line) leads to Furnace Creek through Death Valley Junction. 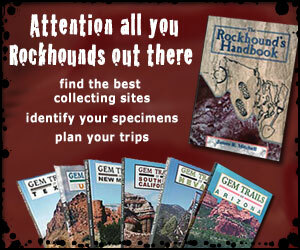 It is a two and a half hour drive from Las Vegas by automobile. A 4-wheel drive vehicle is recommended for backcountry travel. Check at the park visitor center or with a park ranger for current back country road conditions. Commercial airlines, Amtrak and interstate buses serve Las Vegas. Amtrak passenger trains as well as interstate buses stop at Barstow, California. Cars may be rented in both cities: advance reservations are advisable. Limited bus and air services are available from Las Vegas, Nevada to Death Valley. For schedules and further information write: Las Vegas-Tonopah-Reno Stage Line, 922 East Stewart Avenue, Las Vegas, NV 89101, or Air Nevada, Box 11207, Las Vegas, NV 89111.